In a field loaded with admirable choices, the 2014 GMC Terrain sub-midsize crossover offers a decently feature-laden commuter car and mall hopper. Seating for 5 is complemented by 63.9 cubic feet of cargo space with the rear seats folded, while the standard 4-cylinder powerplant can be swapped for a potent V6 mill for some additional towing power and passing confidence. Again available in four trim levels, the better-than-just-base SLE-1, the up-featured SLE-2, the well-wrought SLT-1 and the flagship SLT-2, this handsome mini-ute comes with standard front-wheel-drive (FWD), but can be equipped with available snow-stomping, turn-taming full-time all-wheel drive (AWD). Oh, and there’s the over-the-top Terrain Denali that’s covered in a separate review. Tweaks for 2014, meantime, include some slight updates to standard and optional equipment, including new wheel selections and an all-weather cargo mat that is now part of the SLE-2 trim’s available Chrome Package. Standard power for this latest Terrain edition is a 2.4-liter inline 4-cylinder (I4) engine that puts out some 182 hp. Managed by a standard 6-speed shiftable automatic transmission, this anemic four-banger is good for 172 lb-ft of torque, which translates to a mediocre-at-best 1,000 pounds of towing capacity with the proper equipment. Mileage, meantime, is a rather tepid 22 mpg city/32 highway with standard FWD variants and 20/29 when toting available AWD. The preferred, at least by reviewers, powertrain for Jimmy’s midsize mini-ute is the available 3.6-liter V6 engine mated with the 6-speed shiftable automatic. Look for a peppy 301 hp and 272 lb-ft of torque from this well-wrought V6, with towing capability upped to 3,500 pounds. As expected, mileage suffers significantly with this added power, with V6-equipped FWD editions estimated at 17/20, and AWD versions burning gas at a 16/19 clip. Furthermore, both engine choices can be ordered in E85 ethanol-burning Flex-Fuel form (FFV). The traditional appeal of this high-end small-hauler is a lengthy standard features list that gets more impressive as you climb the lineup. The entry-level SLE-1, for example, sports standard 17-inch alloy wheels and heated power-adjustable wheels outside, with cloth upholstery, a two-way power-adjustable driver’s seat and simulated alloy accents adorning the interior. Cruise control and telescoping tilt-wheel steering, of course, remain standard, as does an auto-dimming rear-view mirror and a rear-view camera that interfaces with the standard 7-inch touchscreen display for entertainment and Bluetooth/OnStar hands-free communications and voice navigation functions. Air conditioning also returns to this base trim, as does an 80-watt audio system that boasts a single-CD player, 6 speakers and satellite radio. Running with all of the above, the SLE-2 gains its added prestige with a standard roof rack, an 8-way power driver’s seat, Sun-Sensor-interfaced climate control, and 250 watts of audio power sent through 8 Pioneer premium speakers. The penultimate SLT-1 flaunts everything in its lower-end sibling as well as heated front seats, leather upholstery, and front and rear floor mats, with the top-shelf SLT-2 tossing in 18-inch wheels, a power sunroof and rear liftgate, rear parking sensors, a remote garage door opener, reverse-tilt mirrors, skid plates and memory for driver's settings. In business-as-usual fashion, options for the lower Terrain trims include many items found standard on higher trims. If more extras are desired, there’s stuff like a hard-drive-based navigation suite that sports Intellilink technology allowing access to Pandora and Stitcher radio, upgraded and upsized wheels and a towing package, all of which are available to the SLE-2 and higher trims. The high-end SLT-2, additionally, can be delivered with available rear-seat DVD entertainment. Add-ons like the self-explanatory Chrome Package and an equally self-explanatory exterior protection package, not to mention a Cargo Convenience Package are also available, depending on the trim selected. Standard safety equipment for the 2014 Terrain lineup again includes 4-wheel antilock brakes (ABS), traction and stability control, front side-mounted airbags, and front and rear head airbags. OnStar emergency alerts and assistance remain standard in all trims, while each also boasts daytime running lights, front fog/driving lights, dusk-sensing headlights, a post-collision safety system and a remote antitheft alarm. A forward collision alert, finally, as well as a lane departure alert system are each optional in lower trims and standard for the SLT-2. 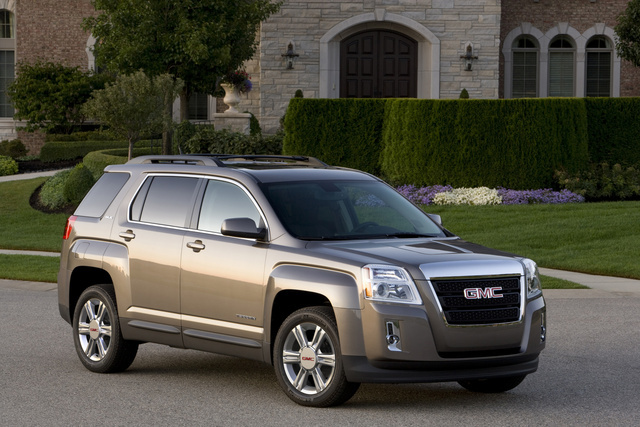 What's your take on the 2014 GMC Terrain? 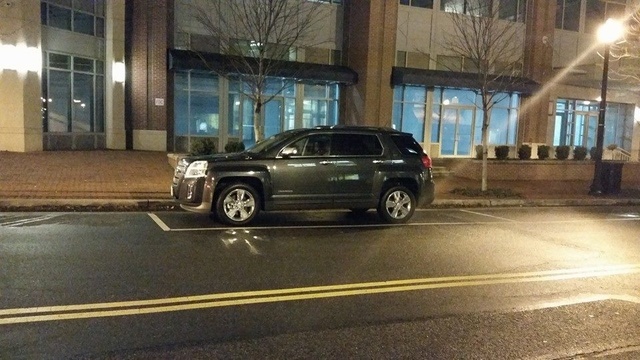 Users ranked 2014 GMC Terrain against other cars which they drove/owned. Each ranking was based on 9 categories. Here is the summary of top rankings. Have you driven a 2014 GMC Terrain? Can’t Get The Key Out Of The Ignition On 2014 Terrain? I can’t get the key out of the ignition. Why do I need a nedw battery cable?